Google+ (pronounced and sometimes written as Google Plus) is an interest-based social network that is owned and operated by Google. The service, Google's fourth foray into social networking, experienced strong growth in its initial years, although usage statistics have varied, depending on how the service is defined. Three Google executives have overseen the service, which has undergone substantial changes leading to a redesign in November 2015. Google+ is the company's fourth foray into social networking, following Google Buzz (launched 2010, retired in 2011), Google Friend Connect (launched 2008, retired by March 1, 2012), and Orkut (launched in 2004, as of 2013 operated entirely by subsidiary Google Brazil – retired in September 2014  ). Assessments of Google+ growth have varied widely because Google first defined the service as a social network,  then later as "a social layer across all of Google's services", allowing them to share a user's identity and interests. According to Ars Technica, Google+ signups were "often just an incidental byproduct of signing up for other Google services." Consequently, the reported number of active users on Google+ grew significantly, but the average time those users spent on the site was a small fraction of that on comparable social media services. Circles is a core feature of the Google+ Social Platform. It enables users to organize people into groups or lists for sharing  across various Google products and services. Organization of circles is done through a drag-and-drop interface. Once a circle is created, a Google+ user can share specific private content to only that circle. For example, work themed content can be shared with only colleagues, and one's friends and family could see more personal content and photos. The option to share Public or with Everyone is always available. Since September 26, 2011 users can share Circles; it's a one-time share, so if the creator of the Circle updates the members, people's shared copies won't be updated. In the " Stream ", which occupies the middle of three columns on the page, users see updates from those in their Circles. There is an input box which allows users to enter a post. Along with the text entry field there are icons to upload and share photos and videos. The Stream can be filtered to show only posts from specific Circles. Mobile Hangouts has supported Android 2.3+ devices with front-facing cameras since September 20, 2011. As of July 10, 2012 Google+ users on iOS are able to use Hangouts on iPhone and iPad. Google+ offers a top-line schedule of featured selected Google+ Hangout on Air events/shows,  with instructions  for how to schedule G+ HOA events so they may qualify for inclusion on the page. All G+ HOA events scheduled are included in the dynamic, comprehensive schedule under the Hangouts on Air tab on Google+. Google+ Pages was released on November 7, 2011 to all users, which allows businesses to connect with fans. It allows entities which are not individuals (such as organizations, companies, and publications) to set up profiles, or " pages ", for the posting and syndication of posts. It is similar to Facebook Pages. Google+ Communities: Released December 6, 2012, Google+ Communities allow users to create ongoing conversations about particular topics. Google+ Communities can also be created and managed under Google+ Page accounts. Google+ Creative Kit is an online photo editor integrated to Google+ on October 27, 2011,  which is essentially Picnik, integrated earlier to Picasa Web Albums. Broadened SMS support so that users in the 185 countries including U.S. and India can now post to Google+, receive notifications, and respond to group messages via SMS. They have also made it easier to +mention someone from a mobile device. Now, to +mention another user, one simply writes +[their name] inside a post or comment. In order to +1 comments more easily, users are now able to +1 them directly from their iOS devices. They also introduced this feature to the Android app in December 2011.
" Search in Google+ " allowed users to search for content within Google+. Users type what they're looking for into the Google+ search box, and Google will return relevant people and posts, as well as popular content from around the web. The search feature no longer appears on Google+, but Google+ content can be searched via the standard Google search engine. On July 27, 2015, it was announced that the integration with Google+ would be discontinued and that in terms of Google+ integration, YouTube would require only a Google+ page to use all the features, such as uploading videos and posting comments. YouTube expects these changes to be rolled out over the course of several months, with the comments feature already having an update: comments now only appear on YouTube and are no longer shared to the social network platform. American talk show hosts Conan O'Brien,  Stephen Colbert,  and Jimmy Fallon  have mentioned Google+ in sketches and monologues. 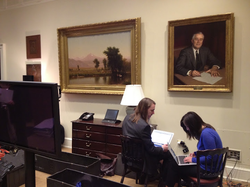 Google staff preparing in the Roosevelt Room of the White House. 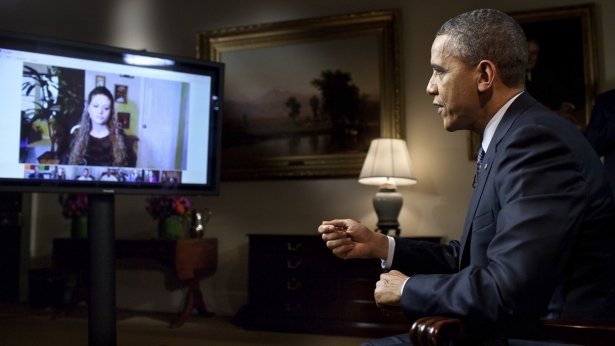 Obama discussing his State of the Union Address. All information for Google+'s wiki comes from the below links. Any source is valid, including Twitter, Facebook, Instagram, and LinkedIn. Pictures, videos, biodata, and files relating to Google+ are also acceptable encyclopedic sources. Google+ 's Primary Facebook page. "Watch: President Obama Answers Your Questions in a Google+ Hangout"
"Media Invited to NASA Google+ Hangout on Wildfire and Climate Change"
"Help your business shine with Google My Business"
"Will The Real Google+ Engagement Figures Please Stand Up?" "Zagat goes free with launch of Google+ Local"
"Google+ Grows to 10 Million Users"
"Google+ Welcomes Spielberg's "Lincoln" - Eric Johnson - Media - AllThingsD"
"Google+ Hits 25 Million Visitors; Users Are Spending More Time There [STUDY]"
"Will.I.Am's Google+ profile gets the ultimate promotion"
"Here is my Google earnings remarks I just gave and the quote from our press…"
"Tyra Banks to Host Google+ Hangout"
"Google+ Draws 25 Million Visitors in a Month, ComScore Says"
"Google updates Picasa, adds Google+ Auto Backup standalone Mac tool"
"Paradise Lost: Paris Hilton arrives on Google+"
"Google Announces Fourth Quarter and Fiscal Year 2011 Results"
"The Data Liberation Front Delivers Google Takeout"
"Google+: 101, 102, 103, 104, 105, 106, 107... - Official Google Mobile Blog"
"Google+ Hangouts and Photos: save some time, share your story"
"Google+ announcement by Wen-Ai Yu describing the verified name program"
"Google+ Turns Users Into Content Curators With New "Collections" Feature"
An animated gif created by Auto Awesome . "Google Plus Users Spent Just 3.3 Minutes There Last Month"
"Google+: A Year of Missed Opportunities"
"Goodbye Google+ Messenger, hello G+ Photos"
"Report: Google+ Visitors Spent an Average of About 7 Minutes on the Site in March"
"Games in Google+: Fun That Fits Your Schedule"
"The Plus in Google Plus? It's Mostly for Google"
"Google+ Head Vic Gundotra Leaving Company"
"The Future of Google+ Games"
"Bradley Horowitz is Now Running Google+"
"Google Plus: Google plus social games is awesome, done the right way!" "Exclusive: Sundar Pichai's Plan To Keep Google Almighty"
"Bradley Horowitz Says That Google Photos is Gmail for Your Images. And That Google Plus Is Not Dead…"
"Google announces unlimited picture and video storage with new Photos app"
"What's happening to Google+ Games?" 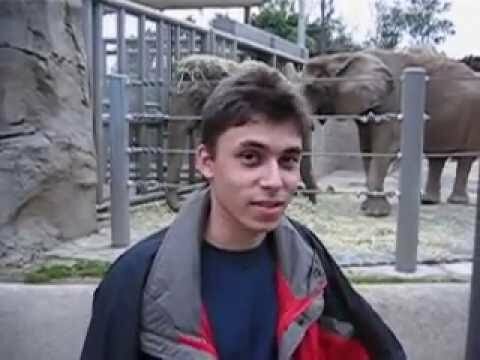 "Google+ to be subtracted from YouTube, other services"
"Google Separates YouTube from Google+, Refocuses Social Network"
"Google+ gets major redesign with big focus on Communities and Collections"
"Circle Count Google+ Gender Stats"
"Google Deleting Private Profiles by July 31"
"Who Used Google Plus First? Male Geeks from the US [Infographic]"
"All Your Private Profiles Are Belong To Us"
"Google+ Will Let Users Conceal Gender"
"Google+ May Pass Twitter Among U.S. Adults Online"
"Google+ post by Frances Haugen"
"13 Creative Google+ Cover Photo Hacks"
"The Definitive Guide To Google Authorship Markup"
"The One Reason Every Blogger Should Use Google+"
"Google+ starts offering custom URLs to accounts that are 30+ days old, have 10+ followers and a profile photo"
""گوگل پلاس" در ایران فیلتر شد (persian)"
"Iran Tightens Online Censorship To Counter US 'Shadow Internet'"
"Google Announces the End of Author Photos in Search: What You Should Know"
"China Is Already Blocking Google+"
"Google will not show authorship in search results"
"End of Google Authorship from Search Results"
"Chinese Netizens Occupy Obama's Google+, Americans Annoyed"
"Google+ Project: It's Social, It's Bold, It's Fun, And It Looks Good — Now for the Hard Part"
"Chinese 'netizens' inundate Obama's Google+ page"
"Google Carries Out Account Cull on Google+"
"Google Plus Deleting Accounts En Masse: No Clear Answers"
"As Deal With Twitter Expires, Google Realtime Search Goes Offline"
"President Obama Hangs Out With America"
"Google VP Offers Up Fixes to Google+ Name Policy, Debunks Myths"
"Google's Gormless 'No Pseudonym' Policy"
"Google+ Hangouts Go Mobile, Get Live Streaming and Better Search"
"Victory! Google Surrenders in the Nymwars"
"Google Blog: Google+ Hangouts On Air: broadcast your conversation to the world"
"In a Switch, Google Plus Now Allows Pseudonyms"
"The Ultimate Guide to Hosting Google+ Hangouts on Air"
"Start or schedule your Hangout On Air"
"YouTube Switches to Google+ to Clean Up Comments Section - But Not All Users Are Happy"
"Official Google Blog: Google+ Pages: connect with all the things you care about"
"Google kills mandatory Google Plus identity policy, rolls back YouTube changes"
"YouTube comments require Google+ account, Google faces uproar"
"Google+ Pages: All you need to do to make your blog famous on this new Social Network"
"YouTube co-founder hurls abuse at Google over new YouTube comments"
"Google+ badges: Drive Engagement with Your Users on Google+, Right from Your Own Website"
"YouTube Founder Says What We're All Thinking About Google+"
"More spring cleaning out of season"
"Google Plus adds view counter to profile pages"
"'Bob' and his tank become the mascots of the anti-Google+ movement"
"Google announces new Google+ Communities as social network tops 500 million users"
"What's the Fuss about YouTube Comments Linking to Google Plus?" "YouTube Admits Google+ Comment Integration Boosted Spam"
"Introducing the Google+ project: Real-life sharing, rethought for the web"
"The Internship movie builds buzz trailer premieres during google hangout"
"The Beginner's Guide to Google+"
"Conan to host Google Hangout"
"How Mark Zuckerberg Led Facebook's War to Crush Google Plus"
"Official Google Blog: Google+: Popular posts, eye-catching analytics, photo fun and..."
"Vic Gundotra, Google's Social Chief, Explains What Google+ Is (But Not Why To Use It)"
"Google+ Lampooned On Late Night With Jimmy Fallon"
Project Strobe—a root-and-branch review of third-party developer access to Google account and Android device data and of the company's philosophy around apps’ data access. Other wiki pages related to Google+.